My next plan is to build out a big mob of Flash Gitz. 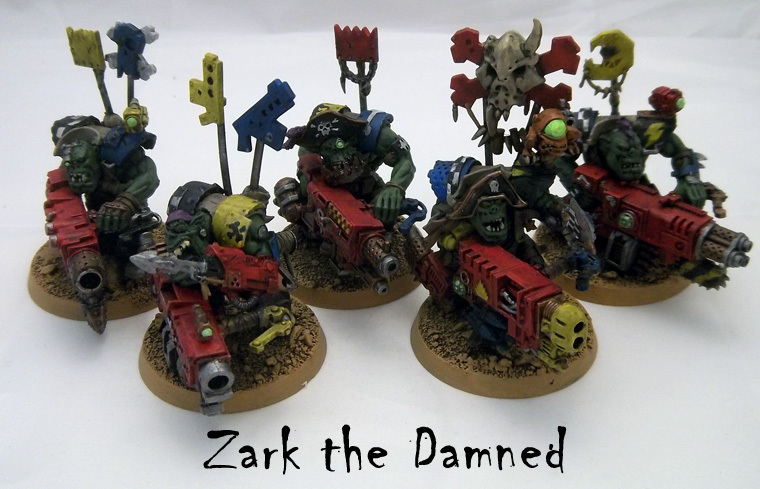 I like the GW models, but I want to keep my options open- does anyone know another maker with some high quality Flash Gitz equivalent? Conversions are of course not a technical problem but I don't have as much time so I'd like to start with a base that won't need as much work.I'm not super into the pirate theme with Badrukk and whatnot but I don't hate it either. I could always chop up some of my leftover deffguns and put them on some nobz, but maybe there's something neat out there? 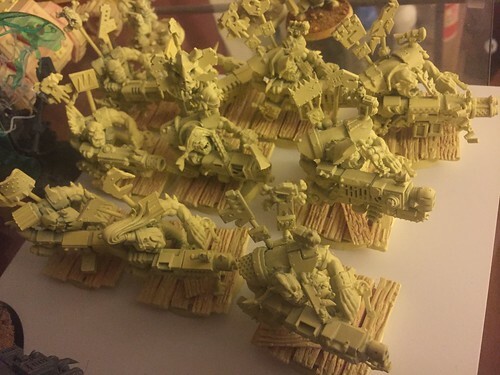 Five of the weapons are snazzguns and the other four are modded kombishootas, four of the bodies are flashgitz and the other five are nobz. You have a superb hand at making models look field-worn. The patina work is top notch. I was thinking about using some nobs to fluff out a force, I don't want 20 of mostly the same set of 5 after all. I was thinking too maybe I could cybork them up, they should all have gitfindas anyway. I didn't have a specific theme in mind beyond something that doesn't clash with my Afrikakorps/Desertrats theme, buy cybork-kommando blood axe flash gitz. Maybe some berets? I wonder if anyone makes some good nob-sized cybork parts. Cheers for the Comps. I originally did the guns quite clean but they looked way too plasticky so I hadn't much choice but to grubby them up a bit. Afraid I can't help with the other stuff although there is a lot of variation to be had by just mixing up the weapons, bodies, arms, heads and paint jobs. Good luck sorting some for yourself. So I'm in a bind: I can find anything I want, but not at the size that I want. Everything is either boy or boss sized, no medium, as it were. What the hell do I do now? My skills are limited to making field caps, melding bitz and correcting defects. Never picked up the skill, and at this point, never will . Go ahead and have a laugh, an ork player who can't carve out an ork outa greenstuff. 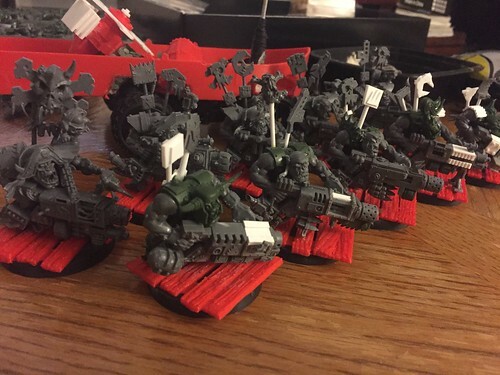 But I'll tell you what I can do, I can pick up some various nobz and just use regular parts until just the right cybork bitz come along, and then I'll just buy them! 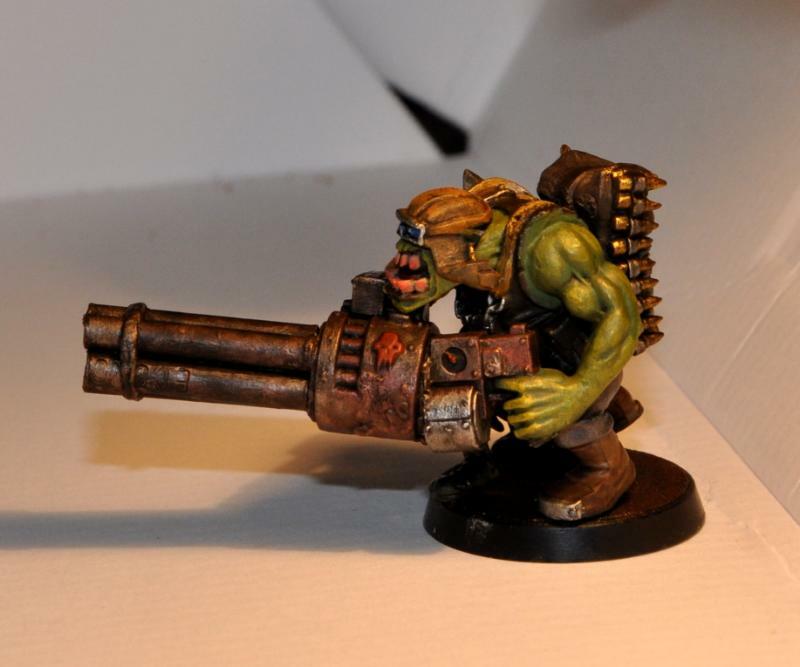 These guns look good on nobz, I'd cobble together a few more barrels onto them though for flashgitz. They also have a few bionic bitz you might could use, along w/ some steampunk backpack bitz that could be something else. 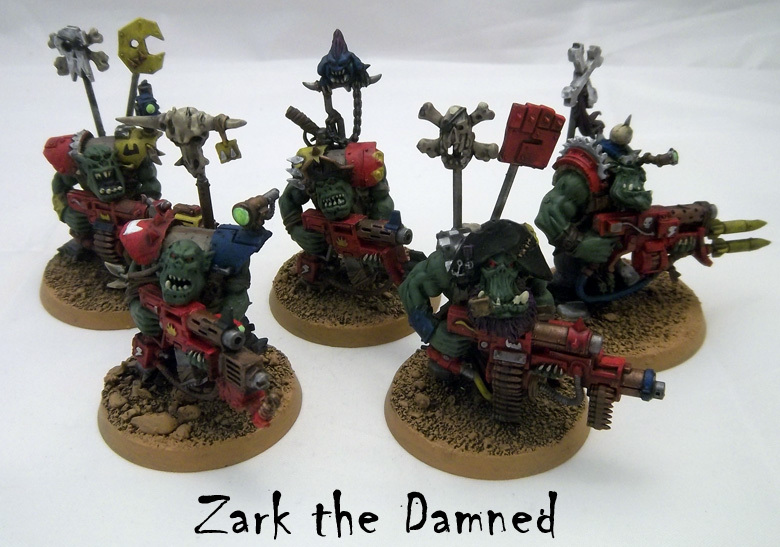 This site has a larger selection of ork stuff. Note when the description is "bulky" that means nob. Shortening the box set barrels is a good idea. Despite all the added extra stuff I found they were too uniform for my liking. I've always felt that when you look at a snazzgun you shouldn't know what it is, what it does or how it works. I found the gitz & nobs don't quite fit together as seamlessly as one would like, but you can definitely make a good mob of gitz out them. Useful information here, I wouldn't have expected the flashgitz and nobz to not fit together smoothly, on account of it all being CAD design. I'd seen those ork heads earlier but definitely not those guns, thx. I just mixed the Nobz kit together with the Flash Gitz to do mine (plus some Ork Pirate heads from Spellcrow), they work out quite well. I had some spare extra combi shootas from another Nobz kit and modded a couple of them. Mixing the kits worked pretty well, iirc there wasn't much trouble with fitting them together. The rest was just making sure I had some spare 40mm bases to unify them more. I used a pack of flash gitz and a pack of nobz from the AOBR box. I found some flash gitz snaz guns on ebay for cheap and cobbled some more together. The base it 3d printed for them to be walkin' da planks. Once coated you can't really tell. Don't those after-market heads look wonderful next to the featureless GW wunz! Yeah, GW really could do with making the jaws separate from the heads - it'd give them more scope for sculpting the face and the customer more options for varying the faces. So, my next question: has anyone around here used or seen these maxmini, miniguns? I'm worried they'll look too weedy in beefy ork nob hands. Some of the others I've seen might be too big. These ones on puppetwar might be just right, just gotta make some handles and an ammo feed. I bet the Kromlech ones would be better. "No pirates though, I decided I don't want any pirates stinkin' up my waaagh!" Orks in pirate garb have always struck me as being odd. How would they know what pirates are? Is someone going to tell me that Orks picked up the pirate concept up from reading a weedy 'oomie history book? I do like the minigun idea. The Kromlech, MaxMinni, and Puppetswar miniguns are nice, but have a very beakie look to them (Puppetswar looks the most generic, and are be the best of the lot, imho). Make your own miniguns with small diameter aluminum or brass tubing; both metals cut easily, and don't deform while cutting like plastic can. Use superglue to attach the barrels, it's not hard to make your own weapons. Always try to challenge your modeling skills, that's how you get better. Things get easier to do as your experience increases. Happy converting!